Good news for some of the top chiefs at tech companies: They had an average approval rating of 80% or better. 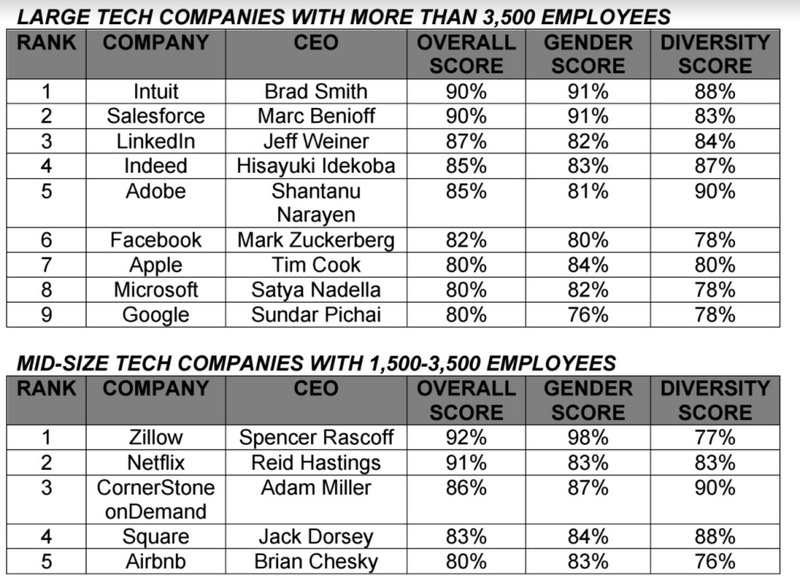 Comparably polled over 5,000 employees from small, midsize and large private and public tech companies including Apple, LinkedIn, Microsoft, Google, Facebook, Netflix, Square, Intuit, Salesforce, Airbnb, Slack, and others. They were asked to rate their CEO on a scale from 1-10 and also broke out results by gender and various ethnicities. Brad Smith from Intuit, Spencer Rascoff of Zillow, and Sameer Dholakia of SendGrid all clinched the top spot with scores of 90% or better overall. The three also scored high marks from their female staffers. Neither Jeff Bezos, nor Travis Kalanick received high enough approval ratings to make the list.